The JBL Commercial® CSR series remote controls, including CSR-V, CSR-2SV, and CSR-3SV, can use analog DC voltage to provide logic control ranging from source selection and volume. Wired with Cat 5 cable with universally accepted RJ-45 connectors up to 1000 feet (305 m) length, the CSR series remote controls allow you to remotely select the source and/or control the volume on the CSM mixer. 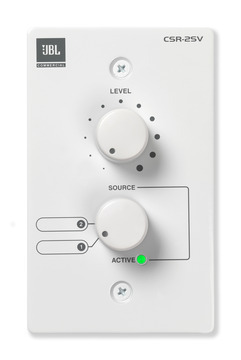 Using CSR-V remote control with your CSM mixer, you can remotely control the volume of the source selected by the mixer. Using CSR-2SV or CSR-3SV remote control with your CSM-21 or CSM-32 zone mixer, you can remotely control the source on the mixer and the volume of the source.